I've been having a bit of a thin time with the fishing recently. Since the salmon I had on the fly it's been pretty quiet (I guess I shouldn't complain). Some of my pals have had a few bass, mostly small, on lures and as always there are reports of the odd big one from different places. Anyway, on the rare occasions when conditions were suitable I've tried to stick to my plan of freelining big deadbaits for the bass. So far I haven't had a bite but last week something happened which gave me a bit of encouragement. I was down on the beach at the crack of dawn and to my surprise I found another car already in on the cliff top car park. 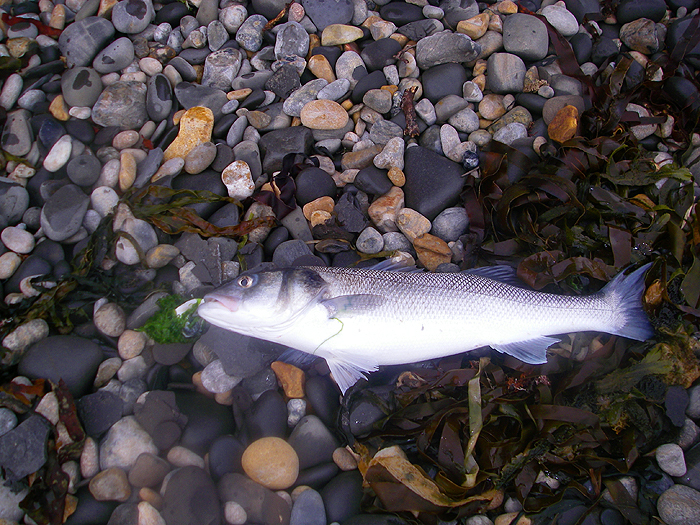 I picked up the gear and walked along to my chosen spot - conditions looked good so I carefully placed my mackerel bait on its 6/0 circle hook on the sea bed and sat on a boulder waiting for the tide to come in. It was easy fishing as there was no wind at all but by the time the water had risen so that there was half-a-metre over my bait I was deciding that it wasn't going to be my morning. 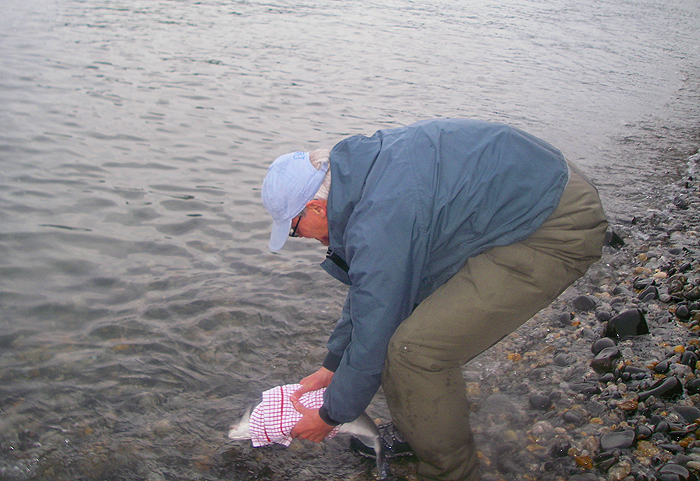 I made the (always difficult) decision to pack in and as I reeled in I saw someone coming back along the shore. As the figure approached it turned out to be Kevin, a chap who visits the area to fish and who I see most years when I'm fishing the Purbeck coast. My friend stopped for a natter and it turned out that he'd also tried a bait but had spent most of his time spinning - like me, all to no avail. We talked as we walked back along the shore. It was still fairly early so when we arrived at a short stretch of shingle I mentioned that I'd caught decent bass there in previous years and suggested that we might give it ten or fifteen minutes before we left. We took up our positions about fifteen metres apart and cast out our baits five or six metres. 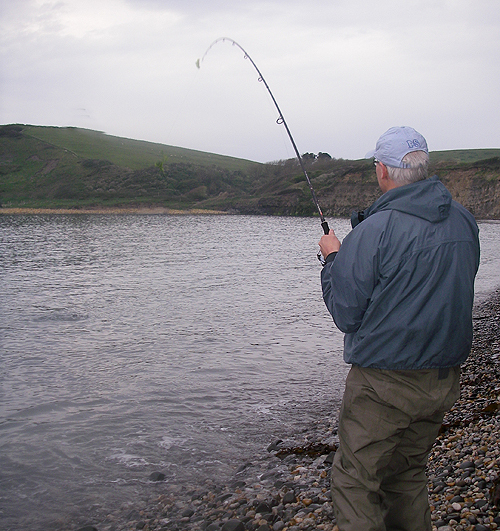 Kevin was using a mackerel fillet on a big J hook (actually a weighted lure hook) and I had lip hooked a mackerel head and shoulders bait. We plonked ourselves down on the gravel and holding our spinning rods with the bale arms open and the line between finger and thumb we waited. For perhaps twenty minutes nothing happened so I thought that the writing was on the wall and decided to 'give them best'. I wound in and walked along to have a last word with my pal before leaving. As I crouched down beside him I saw his line twitch and he muttered something to the effect that he'd had a bite. We were both immediately on the alert and after a few seconds the line began to peel off his spool as a fish went off with the bait. Now the line was running out quickly and Kevin was on his feet and preparing to strike. He dropped the rod tip to give a bit of slack as he gently closed the bale arm then he struck firmly and the rod whacked over as the fish took off. I grabbed my little camera from the bag and began to take a few pictures. The bass fought hard taking line in short rushes and it was a little while before it tired enough for him to draw it onto the gravel. It was a beauty. I picked up my pliers and removed the hook which was further back in the mouth than we would have wanted. Kevin commented that he'd use a circle hook next time he tried. 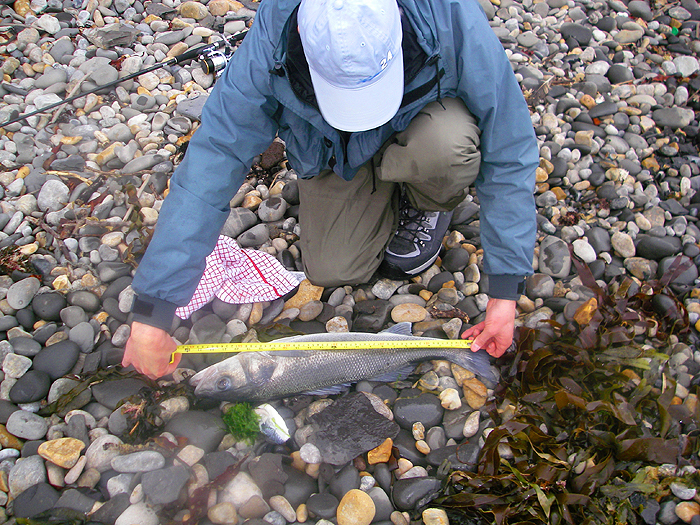 I took a couple of pictures as he measured his fish and carefully returned it to the sea. The took some time to recover but eventually it wagged its tail and swam away strongly. Fantastic! Kevin said it was the best bass he'd had for some time so that was pleasing. Before we parted for home I promised to send him the pictures which I'd taken but of course I found that I haven't got his email address. IF YOU'RE READING THIS MATE CAN YOU DROP ME AN EMAIL - PLEASE? Anyway it was a good finish to an otherwise quiet morning, Perhaps next time it might be my turn. Oh, the only down side to the trip appeared when I downloaded my pictures. There was a tiny speck of dried salmon slime on my camera lens which caused a slight haze on every picture - still it could have been worse. Kevin's bass boils on the surface. Nice one - nearly seven pounds and in good nick. The mackerel fillet's still in its mouth. Back she goes. That's the way to do it.